For many people, rear block kits are a necessity. The reasons for wanting or needing a rear block kit are vast and various, much like the sizes of rear blocks that are available. 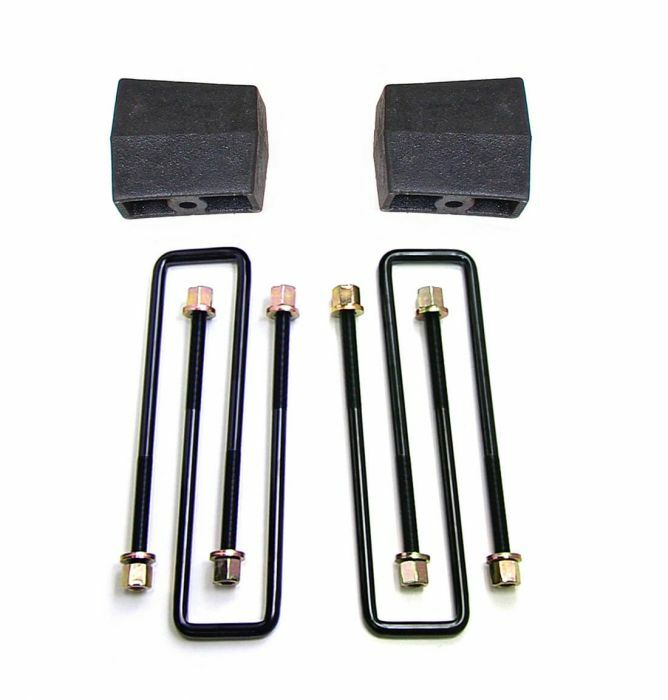 Rear lift block kits serve a variety of purposes; in lift kits such as our ReadyLIFT SST Lift Kits or our larger Complete Lift Kits, taller rear blocks are the ingredient that supplies the lift to the rear of the truck. Most every truck offered by a manufacturer comes with some amount of rake. Rake is the height difference when comparing the front to the rear; essentially the front sits lower than the rear. Manufacturers do this for good reason. Although trucks today are definitely nicer than most cars, the fact still remains that trucks are engineered around a utilitarian application — they are engineered to haul and tow stuff. The “rake” is the result of the rear of the truck sitting higher than the front so that when the weight of cargo is placed in the bed, or a trailer is attached to the hitch, the rear will not sag low and cause unwanted towing and handling problems. If you buy a ReadyLIFT Lift Kit of any kind, it will include a rear block or rear coil spring spacer to lift the rear equal to or higher than the front. The amount of rear lift will vary depending on the vehicle and how much lift is being applied. We do offer several lift kits with different size rear blocks to help the customer personalize their overall lift package. Some people want a near level stance, others may want more rake for towing. Either way, we do provide options. 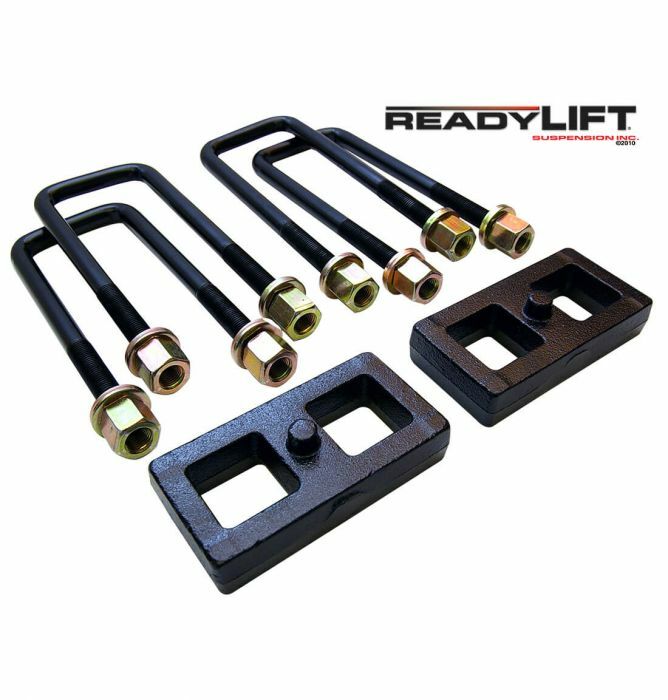 ReadyLIFT was the first company to offer OE style cast iron rear lift blocks complete with longer u-bolts and hardware. Prior to our offerings, enthusiasts could buy a universal rear block, but then they’d have to find their own u-bolts. We took all of the guesswork out and developed rear block kits specific to the vehicle and u-bolts specific to the amount of rear lift. 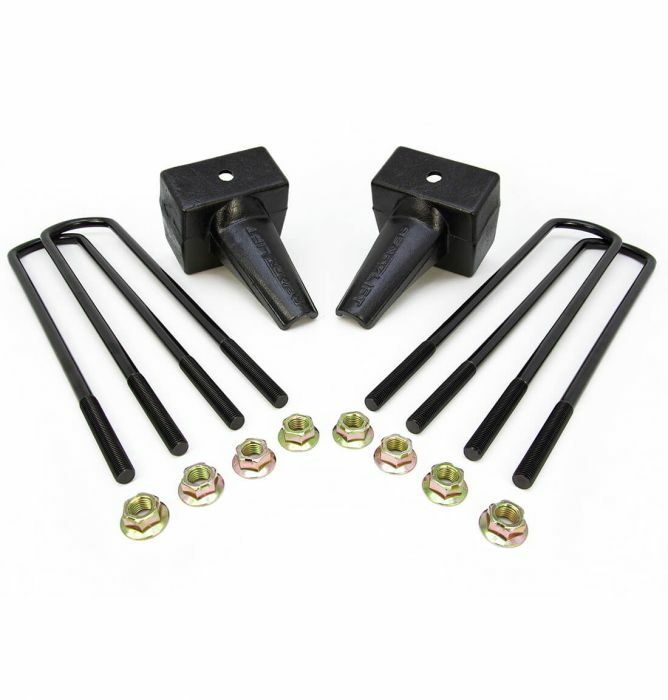 We offer rear block kits from 1 inch to 5 inches in height, again depending entirely upon the application. This leads us to a very important subject when discussing rear blocks; many truck models come from the factory with a rear block. Since stacking rear blocks is illegal in most states, when you install a taller rear block kit, you remove the factory block. If the factory block is 1 inch tall and you are installing a 2 inch rear block kit, you will be getting 1 inch of rear lift. Earlier F250 Super Duty models came with a 2 inch rear block. If you install a ReadyLIFT 4 inch rear block, you will be getting 2 inches of rear lift. Install one of our 5 inch rear blocks, you get 3 inches of rear lift. Some trucks like Toyotas have no rear block, so the size of the rear block you install is the same as the amount of lift that you will get. Remember, stacking rear blocks may be illegal in your state, so be sure to keep that in mind when making a rear block kit purchase. Are Rear Blocks For You? Well, that depends. Have you installed a leveling kit and decided that you need more rake for towing? Then yes, a rear block is what you need. Do you have a stock truck and just need more rake (rear lift) to help with load capacity handling? Rear blocks will help you. Is your truck an older model and the rear leaf springs have started to sag? Adding a taller rear block can help get the rear of the truck back up to where you want it. 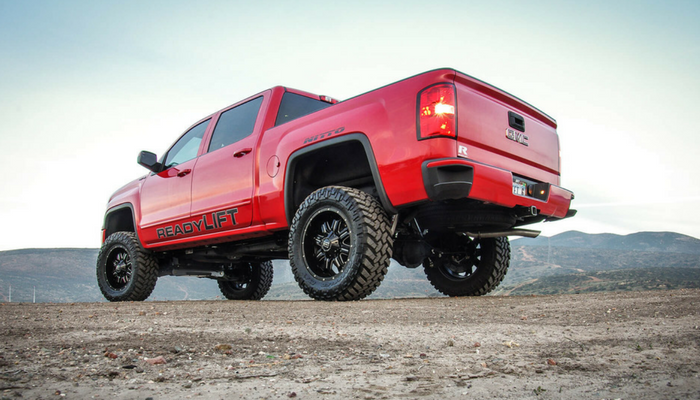 There are a wide range of reasons why you may want to install a ReadyLIFT rear block kit, and chances are good that ReadyLIFT has the size of rear block that you need. Our rear blocks are made from cast iron just like the factory blocks and include the right taper to correct pinion angle. Our blocks also feature built in centering pins and a tough black e-coat finish for extra durability in even the toughest conditions. On many of our rear blocks, we incorporate the factory style bump stop landing which is critically important. If your factory rear blocks have bump stop landings, you want to be sure and replace them with blocks that have the same landings. For some applications like Super Duty trucks, we specifically engineered both flat and tapered rear blocks depending on whether your truck has a single or two-piece driveshaft. It should be noted that on most applications when you lift the rear 2 inches or more over stock, you may need to install longer rear shocks. 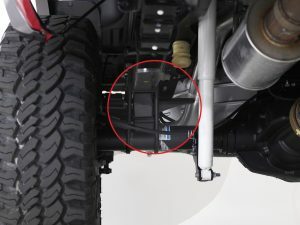 There are a few exceptions, but in general, most factory length shocks do not have enough extended length to accommodate 2 inches or more of rear lift. Our SST3000 rear shocks are engineered for each rear lift height. OR, in some case like with GM trucks, we offer rear shock extensions which allows you to retain use of the factory shocks. When it comes to lifting the rear of your truck, you generally have several height options to choose from. Once you understand what is needed and what configuration your truck currently has, making a choice is pretty simple. To view our expansive line of OE quality rear lift block solutions, cruise over to www.readylift.com and type in your vehicle to see all that we offer. 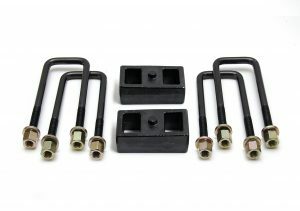 Chances are, we have a rear block kit waiting for your truck. I have a 2005 F250 Superduty and have a 2″ level kit in front. I originally installed this to accommodate a set of 20″ rims with 35″ muds. I have since went back to a stock wheel set up and noticed when pulling our 30′ toyhauler the rear end squats pretty bad. I was wondering what you recommend. I was thinking either an add a leaf kit or a taller block to get the back end back up. Thanks. I want a leveling kit for my 2014 Silverado that will raise the front about 3 inches and 1 inch more in the back. Do you have any kits for my application. Need a bit of advice. Have 1999 Dodge 1500 2wd truck and the rear springs have sagged a lot over the years. I am thinking might need to raise it by about 2 inches to level it out. What is the method to measure what is required? What do you recommend for this issue? 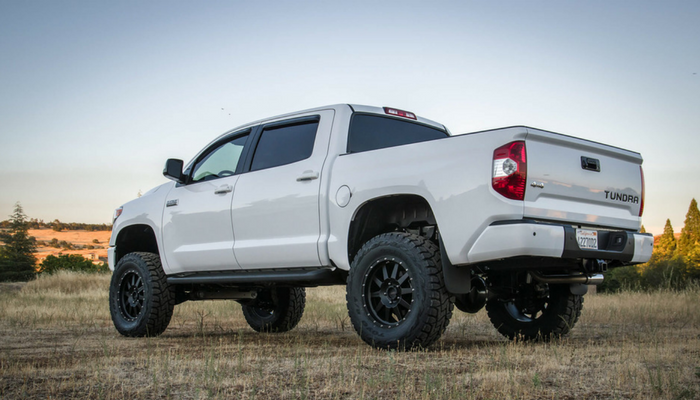 I’d like to lift the rear of my Tundra Pro…not a fan of the higher front look…any suggestions? I have a 2017 Ford F350 Super Duty. I have your 2 1/2 inch level kit on it. I tow a lot and the rear end needs about 1 inch of lift when I have my camper hooked up. Do you offer a block kit that will add 1 inch of height with bump stop tangs in the factory position (I have airbage that are mounted on them)? I couldn’t find anything for a 1 inch rear lift for the newer Super Dutys. I have a 2018 Silverado 1500. I bought the midnight edition and the tire that came with the truck are the good year duratrac 265 65 r18. For now I’m going to use the tires that came in the truck. I am wanting the truck level and I see the leveling kits that you have to offer. Is there anything that you have available that will level my truck but also raise the whole truck an inch front and rear. If a 2.25 on from will level the truck than I’m looking for 3.25″ on front and 1″ on the rear. I am interested and looking into any information you send me. Thank you and happy New Year. 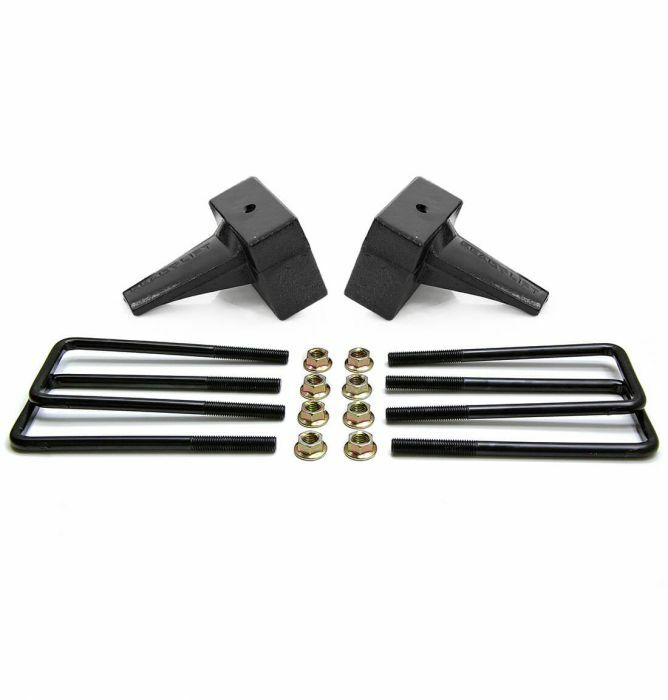 I have a Stock Ford F350 SuperDuty that I use to tow a 5th Wheel RV and I would like to swap out the factory lift blocks for ones that are 2″ shorter to allow for a more level towing of my 5th Wheel RV. I’m not sure if I would need flat or tapered lift blocks or exactly how tall the blocks would be in order to lower the rear of my F350 by 2″. I believe the stock 2017 F350 comes from the factory with a 2.5″ rake, so dropping the rear by 2″ should give me pretty much level stance. I plan to add an Air Lift air bag system as well to level the truck when I tow my camper. Hi Jim, I believe that your truck comes with a 3″ rear block. The shortest rear block that we offer for that application is a 4″ tall block,so it doesn’t sound like we have a solution for what you are trying to achieve. Saw a new tundra with about 2 inch lift and air bags in the rear along with springs for adjustability. Any thoughts or opinion would be appreciated. I would like to lift the rear so it doesn’t bottom out, when pulling our trailer.